'Rotterdam is giving houses away for free!' It was with this provocative slogan that the phenomenon of ‘self-renovation houses’ was introduced in the Spangen district in late 2004. It is an unusual form of urban regeneration in which dilapidated houses in old districts are offered for sale for a very low price, on condition that the buyer renovate the dwelling. Self-renovation houses, marketed individually and collectively, seem to be particularly in vogue with newcomers to the housing market and fulfil the bureaucratic aim of luring young, affluent households to unpopular problem neighbourhoods. Industrial designer Rolf Bruggink transformed an old building in Charlois into a dizzying system of voids, floors and stairs where only the chipped outer brick walls appear to have been retained. 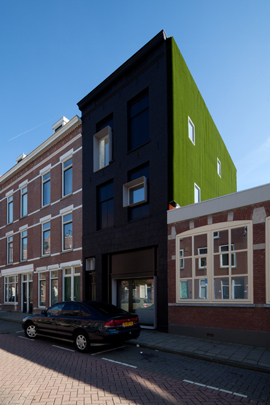 The side elevation was clad with artificial grass and the front facade was painted black after which two stainless steel windows were inserted.